"In Part 2 of our two part podcast on GI Bleed Emergencies Anand Swaminathan and Salim Rezaie kick off with a discussion on the evidence for benefit of various medications in ED patients with upper GI bleed. PPIs, somatostatin analogues such as Octreotide, antibiotic prophylaxis and prokinetics have varying degrees of benefit, and we should know which ones to prioritize. 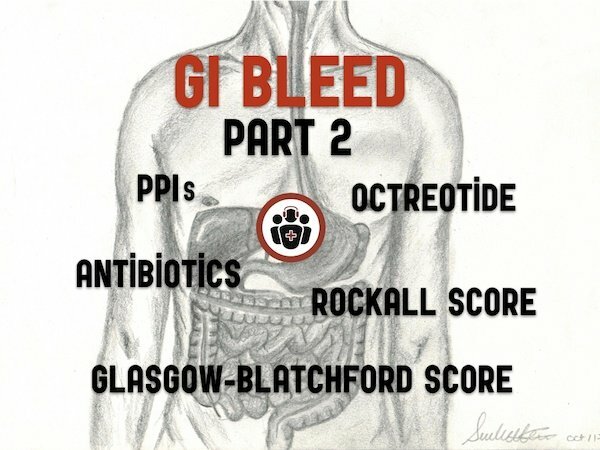 We then discuss the usefulness of the Glasgow-Blatchford and Rockall scores for risk stratification and disposition of patient with upper GI bleeds and hit it home with putting it all together in a practical algorithm. Enjoy!"